I love how bright and positive green can be (leaving all green-eyed monsters aside). A few bright picks for you to elevate your mood and yes, St. Patty's is less than a month away. Green Pendant || This lacquered green is a showstopper. Add this pendant to any room to add a fun punch. White and Gold Marbleized Planters || These elegant and chic planters go with everything and they look perfect in the set of two. Ferragamo Ballerina Flats || I love Ferragamo ballerinas (mine are patent leather) but I just love this lace option for the warmer months. And they are perfection in this Kelly green color. Leafy Earrings || You know all about my love for leaves so you can imagine how I love these. I have a pair of Mercedes Salazar earrings and they are SO VERY comfortable to wear. These would be a great addition to any statement earring collection. Banana Leaf Inflatable || How come they just invented this!!! It would have been ideal for our pineapple chic party last year. And those leafy earrings from above as well! Greek Key Dresser || An instant classic for your home. There are few better color combinations than green and gold. This one is a real lust-worthy piece. Guest Towel || Pretty and delicate, the perfect way to pamper your guests as they dry their hands. Green Lace Dress || Ok, WAO!! This dress in this emerald green is EVERYTHING. Feminine and elegant you will be the center of attention. And I think green and plunging necklines are flattering on everyone! Foo Dog Lamps || This duo is a vibrant compliment to any console or desk. 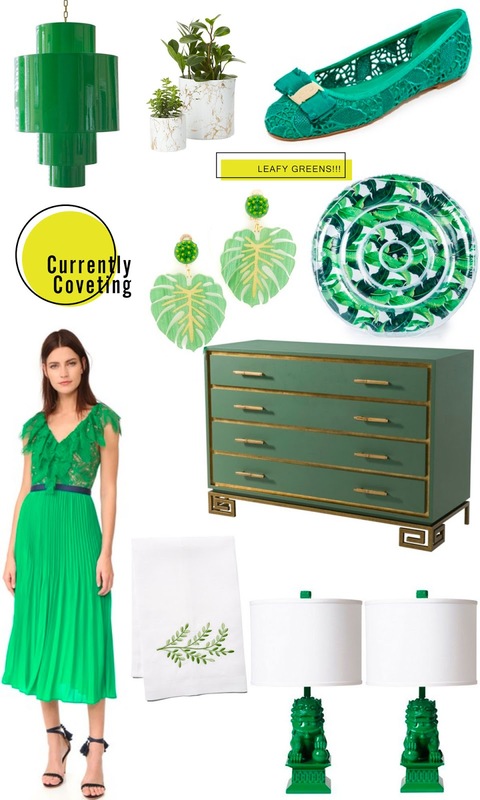 So many gorgeous greens - love the Greek key chest! Happy Thursday!